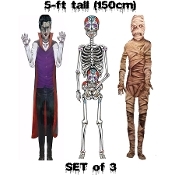 Colorful Cardboard Hinged Sectioned Pictures Fold-outs, Spooky Cutouts, each unfolds to 5-feet tall!!! Zombie walk, Undead Monster, Voodoo Creature, Halloween Create-a-Scene Setters Props Accessories Costume Party Supplies. Use to create the spookiest haunted house on the block! For decorative purposes, Indoor only. Goes anywhere... Display in entry or hallway to greet unsuspecting guests! One arm is adjustable up and down. Both legs swivel together, not individually. Head tips from side to side. Sold only in Sets of 3, as pictured, ONE of EACH Style. Material: Lightweight Cardboard, metal rivets.